Quickly repair your Dolmar trimmer with replacement trimmer head parts from Jack's. Common wear items include the trimmer head spring, spool, and bump head knob. These parts help your trimmer head take on all your weeding and trimming needs. Select the parts you need below. 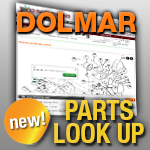 Or check out our selection of Dolmar trimmer heads.